I just Facetime to parties these days… but i make sure i still don’t make eye contact. During hurricane Sandy, the power went out for a week…my family actually started talking to each other, playing games with each other, I took up knitting and some leftover hobbies ( the boredom was exasperating)…. Even with a smart phone i still can’t figure out who acted in what cause i forget the name of the movie. Quick google what was the name of that movie with that fight with the guns.. I am so terrible at short term memory. I know I’m kinda late with this information, but that’d be “People Shooting Each Other With Guns—The Movie“. I prefer to read Uncle John’s. 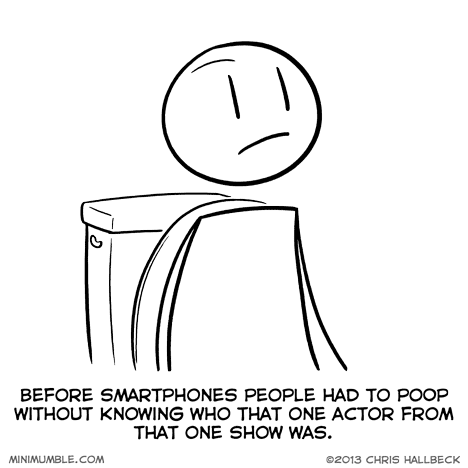 Then you blow your mind when you realize that maybe the actor you’re thinking of might just be on the toilet looking up another actor the same time you are.